Two things occured over the past few days which have lead to this post. Firstly, Zohar over at ManoflaBook.com, posted a review of H.G.Wells’ seminal work The First Men In The Moon. Then he went and got my interest piqued with his fun facts and a fascinating look at some of the covers which have been used on the book over the years. 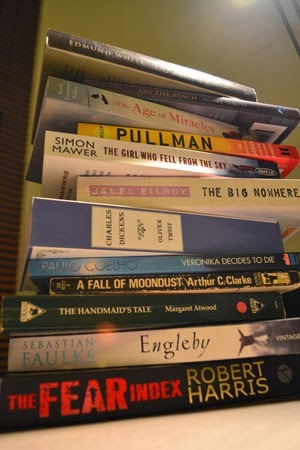 Then, with a house move imminent, I started packing my book library up…a job which I could probably get done in a matter of minutes (what’s so difficult about piling books into boxes? ), but has (so far) taken many hours. Mainly because once I get in amongst a pile of books, I can’t help but start opening the damn things. On the shelves is a collection of mass market paperback science fiction novels which belong to my mum – who is singularly responsible for getting me interested in reading SciFi from an early age. After seeing Zohar’s collection of covers for a singular book, it dawned on me that these books had a fantastic array of weird and wonderful covers, and all of them were surprisingly different. Colourful, dramatic, unusual, menacing, scary, epic. Just some of the superlatives I could use. Forget about Will Smith with his shades, leathers, gun-toting and futuristic bike chases. 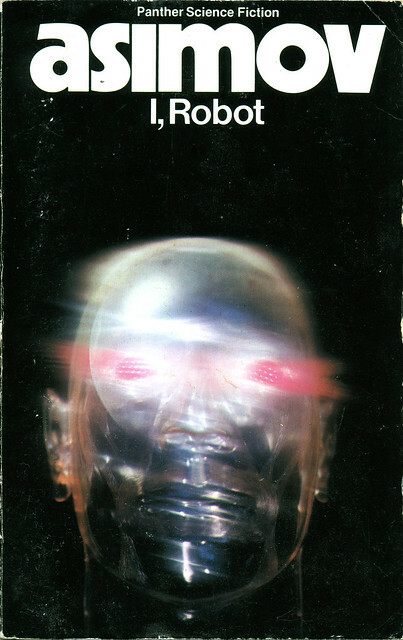 I, Robot is a collection of short stories one of which, “Robbie”, was written in 1940, proving just how ahead of the curve Asimov was. The cover is a triumph in its simplicity. Unlike the busy and bright cover of Citizen of the Galaxy, we’re given a simple glass/perspex head with demonic glowing eyes. Not your typical image of an unruly robot, but enough to send a shiver down your spine at the thought of an automaton gaining its own consciousness. I can thoroughly recommend these short stories, as long as you leave your preconceptions from the film at the door before entering. I couldn’t resist another Asimov – there were a lot to choose from! 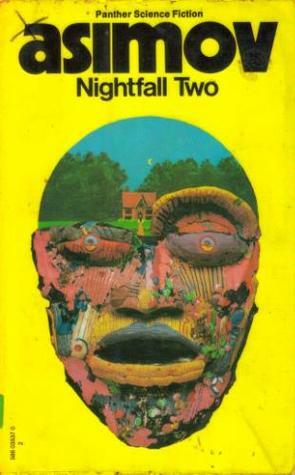 Nightfall One and Nightfall Two are another collection of short stories from the master of SciFi. Nightfall itself is one of the most original stories I’ve ever read and has always stayed with me. It’s one of those reads I return to every so often. The covers of the books, though, are bizarre – a kind of plasticine nightmare which I’ve never been able to fully fathom. 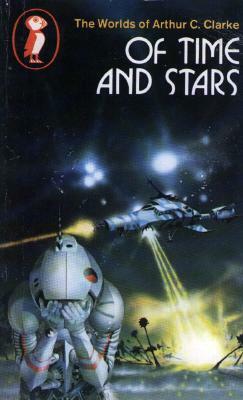 One of my favourite SciFi novels when I was a kid, and the one that got me in to all things Wyndham. Probably because it was about a lonely kid with an “imaginary friend” who turned out to be not so imaginary. A great example of Wyndham’s anti-Space Opera style. Still a great book. This cover proves to me that sometimes the most arresting covers can be the simplest. And so we end back where we began – with Space Opera. 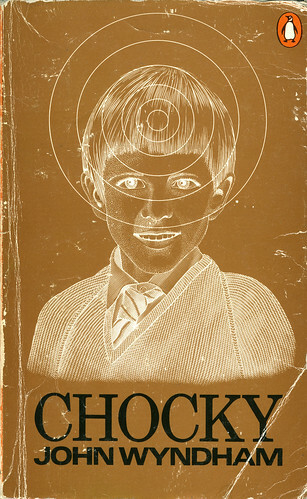 This cover, illustrated by Peter Jones, is very typical of the genre. Note the similarities with the Heinlein cover – the figure in crisis in the foreground, the fantastical space vehicle behind…but this is darker somehow, more sinister. Another great selection of short stories from another master of the genre, Of Time And Stars includes The Sentinel, the story on which the film 2001: A Space Odyssey was based. Well worth a read. This is just a selection of covers from the books in my own collection. There are doubtless many other, better examples out there, but these are the ones that get me wanting to pick up and read. What do you think? If you’ve got others that stand out for you, please point me in their direction.